What new things can you learn about what geckos might be like from looking at the picture? Look at the picture and think about what the gecko looks like. Think about what the picture tells us about where geckos live. 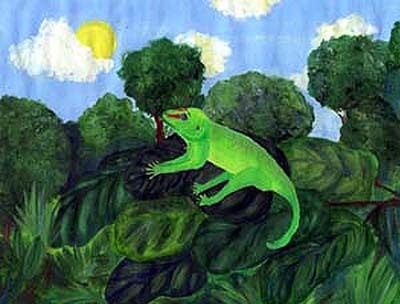 The gecko looks like a lizard that is green, small, and lives in trees or on plants. It's sunny in the picture. I think the gecko lizard lives in sunny places.